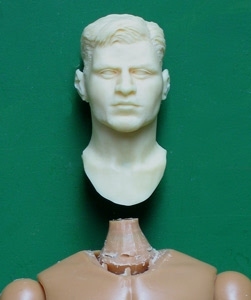 My heads are moulded with the complete neck, for anatomical realism when wearing open-necked shirts etc., so they need a different approach from the conventional vinyl head. Movement is very restricted, since they don't have the obtrusive joint on the neck. 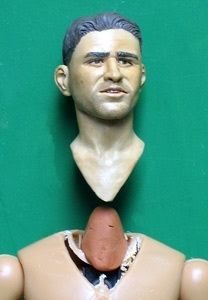 Check the fit of any headgear before painting : you may have to clean up the mouldline a little , and perhaps reduce the hair to get the best fit. Remove the vinyl head by heating it with a hairdryer or hot water, then pulling or levering it off with a screwdriver. First, if your figure's uniform has a high collar, you can of course carve away the sternum and shorten the base of the neck : the resin is easy to carve with a heavy sharp knife ; you can also use a router on a Dremel drill. The neckpost can then be routed down until the head fits over it : you may need to remove quite a lot of material , and also open out the top of the chest. It's better to remove material from the neckpost rather than opening the inside of the neck too much : remember the resin is already fairly thin, and you don't want to crack it. This is essential if you want an open neck. Of course , there is very little rotation, but that's the penalty of realism. I generally attach my heads with office tack, which gives a firm grip without making the joint permanent : I might want to remove the head at some time.